A video is making the rounds on the internet, spreading mis-information about climate change. I have previously said I was sick and tired of addressing the issue ... I had done so years ago in my essay CLIMATE CHANGE DENIALISM and in too many blogs to mention, but - as you can see - I got sucked in again (as had happened also last week, see my blog 954). Update: Here is a SMH article by Ian Dunlop, entitled: As an ex-coal boss, I'm telling pollies: wake up to climate peril. "Given the overwhelming evidence and repeated warnings of the dangers we face, even as a former oil, gas and coal industry executive I find it incomprehensible that proposals for new fossil fuel projects proliferate, encouraged by government and opposition alike ... these projects are crimes against humanity. Fossil fuel investment must stop, now." The video is a talk to the converted - a core audience of Climate Change Deniers - by Steve Goreham. 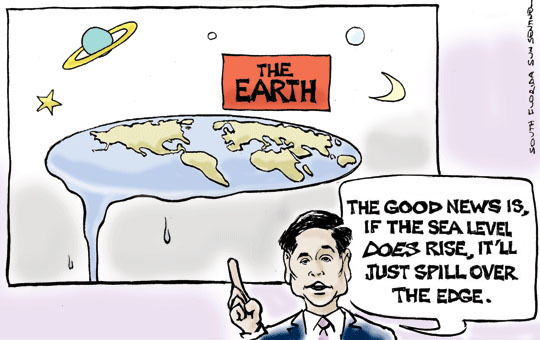 The audience laps up his disinformation, which he dishes out with an arrogant and self-congratulatory air of superiority, all the while ignoring consensus science as he either bemoans the lack of Empiricism or presents his Alternative Facts (he has a study "proving that it's nonsense to claim 97% of climate scientists agree on the science"); going by their reactions, it is clear his audience are dyed-in-the-wool believers ... nothing will ever change their outlook. Goreham uses those standard items of mis-information that climate change deniers rely on; let me point out just one: He says humans produce only 1 or 2 percent of green house gases (it actually is 2 or 3 percent) into the atmosphere (so what's the problem?) … however, what the speaker omits (quite likely knowingly), is the point that while nature produces 97 or 98 percent of green house gases, 100% of their total is naturally absorbed (for millions of years now), whereas the 2 or 3 percent humans produce are accumulative (this is standard climate science knowledge ... the natural cycle adds & removes CO2 to keep a balance; humans add extra CO2 without removing any; skepticalscience.com). Hence we have global warming. And his smug rant on how good Carbon Dioxide is for plants is sheer tendentious, misleading disinformation: CO2 indeed is needed for plants to grow and life to flourish (CO2 is transformed into oxygen by plants) - but, as pointed out above, the fact that human production of CO2 largely doesn’t get absorbed by nature makes it a greenhouse gas, causing global warming. However, more interesting than the tedious video is a look at the speaker. Goreham, an author of books that deny burning fossil fuels causes global warming, speaks for the Friends Of Science (FOS) - a non-profit advocacy organization based in Canada. The organization takes a position that humans are largely not responsible for the currently observed global warming, contrary to the established scientific position on the subject. 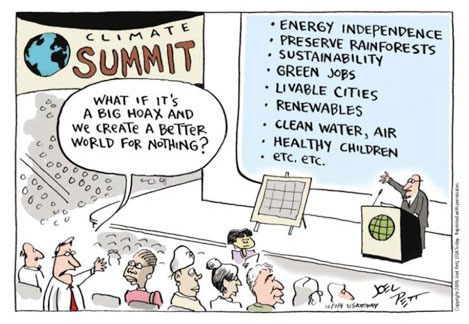 Rather, they propose that "the Sun is the main direct and indirect driver of climate change," not human activity. They argued against the Kyoto Protocol. Tellingly, they are largely funded by the fossil fuel industry. Goreham is also a policy advisor to The Heartland Institute, an American conservative and libertarian public policy think tank … known for their work in the 1990s with the tobacco company Philip Morris to question or deny the health risks of secondhand smoke and to lobby against smoking bans. At the Northeast Public Power Association's annual conference in Lake Placid, N.Y., what was billed as a "common sense" discussion on climate change, was actually a talk by Steve Goreham. His appearance was sharply criticized by a few among the public power managers, directors and board members gathered there. Giving Goreham a significant forum among power managers raises serious questions about their role in responding to global warming and their understanding of climate science. The episode also illustrates how the climate mis-information camp has exploited opportunities to influence climate policy, by targeting those with a direct stake in the policy debate. Indeed ... and there is more good news: If it is true that oceans will rise by 6m - as is predicted if the climate warms by a total of 3 degrees Celsius (as will be the case if nothing gets done about climate change), it will not happen before about 2100. Hence anyone over 65, as well as all those living more than 6m above sea level, don't have to worry. It's a different story - of course - for our grandchildren, and the inhabitants of the Pacific Islands. But enough of all that, let's go back to sleep.